Kita biasanya mengenal bedak, pelembap, pembersih wajah, dan sejenisnya sebagai produk kosmetik. Bagaimana dengan produk pemutih kulit yang aman? Kalau dilihat dari kandungan bahan di dalamnya, produk pemutih wajah memang mengandung beberapa bahan kimia. Namun, konsentrasi bahan ini harus memiliki batasan. Bahan seperti hidroquinon yang bekerja mengelupas kulit bagian luar dan menghambat pembentukan pigmen kulit melanin, pada kosmetik hanya diperbolehkan ada sebanyak 2%. Lebih dari itu, produk dapat menimbulkan iritasi kulit dan merusak melanin. Sementara, melanin berfungsi melindungi kulit dari radiasi sinar matahari. Dengan kata lain, semakin banyak melanin pada kulit, maka kulit akan makin terlindungi. Karena itulah, maka hidroquinon yang kadarnya lebih dari 2%, penggunaannya harus di bawah pengawasan dokter. Dan produk seperti ini digolongkan sebagai obat. Bahan seperti AHA (Alpha Hydroxide Acid) juga dibatasi, yaitu hanya boleh 10% pada produk kosmetik. Lebih dari itu, produk termasuk golongan obat. Sementara bahan-bahan seperti asam retinoat, rodamin, dan merkuri (Hg), sama sekali tidak boleh terdapat dalam produk. Asam retinoat bekerja mengelupas kulit dan dapat membuat kulit terasa seperti terbakar. Rodamin yang berfungsi memberikan warna, juga berbahaya bagi kulit karena senyawa kimia ini sesungguhnya adalah pewarna tekstil yang terkadang dipakai juga sebagai pewarna makanan dan bila dikonsumsi dapat menimbulkan kanker. Sementara merkuri yang tergolong sebagai logam berat berbahaya, juga dapat memicu timbulnya kanker kulit. Bahan kimia ini bersifat mengendap di dalam kulit. Khasiat pemutih pada awalnya memang menggiurkan. Hanya dalam hitungan minggu, kulit mengalami perubahan, seperti menjadi lebih kenyal, mulus, kerutan hilang, dan lebih putih. Tetapi, begitu pemakaian dihentikan, kulit akan kembali ke kondisi semula. Bahkan, kadang-kadang kondisinya dapat menjadi lebih buruk. Yaitu, kulit menjadi hitam atau muncul vlek-vlek. Kulit pun kadang-kadang menjadi merah seperti udang rebus. produk pemutih apa sih yang aman bagi semua pengguna ? On sale in the high street in Harlesden, North-West London, yesterday was a face cream called Maxi White. “Could there be a less subtle name for a product aimed at black and Asian women desperate to lighten the colour of their skin? Indeed, those who purchase the £4.79 gel are guaranteed results almost overnight. “It worked quite well to start with,” said one customer. “But as I carried on using it, my skin became thin and dehydrated. If I moved my mouth, my whole skin moved, too. My forehead looked like a crinkled up piece of paper it was so cracked. The reason can be found in the list of ingredients on the back of the Maxi White packet; one is called hydroquinone – which is as nasty as it sounds; the biological equivalent, in fact, of paint stripper. It not only removes the top layer of skin, which initially results in a “brighter face”, but also the body’s natural defence against infection and the sun, thus increasing the risk of skin cancer. If the chemical – which is used in certain industrial processes – enters your bloodstream, it can cause fatal liver and kidney damage. Other side effects include headaches, nausea, convulsions and permanent scarring. It is illegal to use hydroquinone in cosmetics. This month, a couple who made more than £1 million selling toxic skinlightening creams from two outlets in Peckham, South London, were ordered to pay costs and fines totalling £100,000. Maxi White, and other banned brands containing harmful steroids, are available under – and over – the counter all across the country. A Mail investigation found them on sale from Brixton to Birmingham (one of the shops featured in our investigation was raided by Trading Standards officers yesterday). Behind such names as “Maxi White”, “Sure White”, “Fair & White” and “Skin White” is a multi-million-pound industry – and an untold story of exploitation and racism within the black community itself. It’s a taboo subject, but a cruel racial hierarchy still exists in Britain where the lighter-skinned Jamaican, for example, is “superior” to the darker skinned Nigerian; where light brown is preferable to dark brown. Dark skin means failure; light skin is beautiful and equates to success. It is an attitude all too familiar to Sherry Dixon, editor-at-large of Pride, the lifestyle magazine for the British black community, and reinforced by the complaints that flood in from female readers whenever a woman with strong African features – such as dark hair, broad nose, and tightly curled hair – appears on the cover. “It’s cultural racism, or shade-ism as I call it,” she says. The most photographed – and admired – black women ( Beyonce, Halle Berry, Naomi Campbell, Iman) are all Westernised, of course, whether by their fairer skin or European features. The legacy of such stereotyping can be found in any shop or market stall specialising in black hair and skin products; “Black is Beautiful” was the old slogan, but shelves are bulging with creams and lotions promising a “brighter face”. Not all are harmful; nevertheless they promote the image – intentionally or otherwise – that blackness is something to be ashamed of, and whiteness revered. Southwark Trading Standards officers, who were involved in the Peckham prosecution, have a list of nearly 100 banned cosmetics seized from outlets in the borough over the past few years, including some that contained poisonous mercuric iodide, which can cause organ failure, vomiting and depression. The New Nation newspaper has carried out its own investigation into the scandal. Among the shops it found selling dangerous concoctions was Mona Cosmetics in Harlesden, where reporter Lorraine King purchased Maxi White (Strong Formula). This week, Miss King went to Brixton for the Mail. There, she was able to buy Mic Medicated Skin Litener Cream (“Maximum Strength”) which is on the trading standards banned list. Like Maxi White, it contains potentially deadly hydroquinone, and was on sale at the Afro Beauty Shop in Electric Avenue for 99p. Trading standards officials from Lambeth Council, acting on a tip-off from the Mail, arrived to carry out a search of the premises yesterday. Owners Mohammed Latif, 48, and his brother Wasim Hussain, 28, initially denied selling any of the creams. Boxes of Mic skin whitener were later confiscated; the brothers were cautioned and could be prosecuted. In another part of the country, at Beauty Queen in Soho Road, Handsworth, Birmingham, there are aisles brimming with “exotic” products. But when a Mail reporter asked for a “stronger” lightening cream (a universally understood euphemism for illegal bleaching creams) the man behind the counter produced a tube of cream stashed in a fuse box in the corner of the store. It cost £1.99 and was called Movate. One of its active ingredients is the steroid known as clobetasol propionate. The compound is not banned in this country but such is its potency that it can only be used as a licensed prescription drug to treat extreme skin conditions. Movate was also sold at nearby MJ News. Electric Avenue in Brixton or Rye Lane in Peckham and Soho Road in Handsworth are the last links in a criminal chain which begins thousands of miles away in Africa or the Middle East, where such lightening products are freely available. They are either smuggled into Britain in hand luggage or hidden in freight. Two of the biggest ever hauls, worth hundreds of thousands of pounds, were discovered at Gatwick airport in 2005. Some unscrupulous traders travel abroad to obtain the ingredients – including hydroquinone – themselves. “They mix these drugs together in a bowl in the back of their shop then sell them in plain jars when customers ask for something “stronger” than the products on display,” says Sara Coakley of the MHRA. It is almost impossible to believe, given the widespread publicity such products have attracted, that the people who peddle this poisonous rubbish, if not customers themselves, can be unaware of the dangers. Trading Standards officials in Southwark have flooded the borough with leaflets highlighting the dangers and the consequences of breaking the law, which can result in a six-month prison sentence. The answer can be found in a treelined avenue in Sydenham, South-East London, where Yinka and Michael Oluyemi live in an £800,000 six-bedroom mock tudor house with wooden floors and Persian rugs. Yesterday, a BMW and Mercedes were parked on the drive. Yinka, 46, and her husband Michael, 49 – who ran Yinka Bodyline and Beauty Express in Peckham – evidently found handsome rewards from the skin-lightening business. This week, however, they were given suspended prison sentences after admitting ten charges of flouting medical and safety rules. The Oluyemis are just the latest people to be prosecuted for selling banned cosmetic potions. In 2006, another “cosmetics” company, Ace Afro Hair And Beauty, which has a store in Brixton, was fined £50,000, for similar offences. Hassan Akhtar, 49, who drives a Mercedes, runs the business – which has a £ 1million turnover – with his wife Nasira, 46, and their son Mubashir, 25. The family live in a £400,000 house in South-West London. How many black women use such creams? It is impossible to say, but clearly many do. “I first started using them because I had spots and I thought they would help,” said Marilyn, a hairdresser in her 20s. “I remember using one that burns when you put it on. I would have to sit down and fan myself. Then I watched a programme about skin bleaching in Africa. It was terrible. It showed people with serious skin deformities and tumours. I knew I had to stop. I’d just had a baby and I didn’t want him coming into contact with the chemicals on my face. “I have stopped bleaching my skin but there are so many girls I know who are still doing it. In the dance hall scene, if you don’t bleach your skin you’re not cool. I see some girls with brown faces who still have black hands – it’s horrible. “But it’s very addictive,” she admits. “I have a relative who bleaches her entire body. She goes down to Brixton market and buys massive tubs. Her whole body is light except for her knuckles, elbows, knees and toes. She looks ridiculous. The peer – and indeed cultural – pressure which would persuade someone to apply a cream which contains hydroquinone or powerful steroids is graphically illustrated by the case of Melissa Barnet. Melissa, who is in her late 20s, is the daughter of a Nigerian nurse and businessman from North London. She began using bleaching creams in 2000 after being bullied at school. “Throughout my childhood it just wasn’t ‘cool’ to be African or darkskinned, and every day when I walked through the gates of my all-girls secondary school I was reminded of this cruel racial hierarchy,” she says. “Being a lighter-skinned Jamaican made you superior to anyone darker or African. Eventually, Melissa experimented with the most potent bleaching soap containing hydroquinone in a bid to make herself more “beautiful”. Her skin became noticeably lighter and for the first time in her life she felt “confident and attractive”. It didn’t last long. Within six months, she began to suffer the inevitable side-effects – unsightly dark patches appeared on her face and she realised she had to stop. Fortunately, her skin recovered, though some scars were still visible on her cheeks months later. Like Marilyn, the hairdresser who began using skin-lightening creams, Melissa, a former office worker, was lucky. Some of the women who turn up at dermatologist Sujata Jolly’s clinic in Maidenhead are not. Could there be a more chilling example of the dangers of products like Maxi White? The cultural racism which resulted in that poor woman being treated by Sujata Jolly is reinforced by companies such as Elizabeth Arden on the Indian sub-continent. The face of the firm’s “whitening skincare” range is Catherine Zeta-Jones. Another advert, by British manufacturing giant Unilever, which markets several whitening products in India, shows a young Indian woman dreaming of being famous, but her skin is too brown. One day her sister hands her a tube of Fair And Lovely skin cream. Then the advert flashes forward and she is wearing high heels and her hair is curled. Most important, her complexion has changed dramatically; she is pale and has landed her dream job. Walking around town will reveal just how low some women think of their natural black skin complexion. They strive to achieve a lighter skin complexion because they think that the lighter their skin complexions are, the better and probably more appealing they will look. As such, skin bleaching continues to manifest itself in many black communities where even the supposedly lighter-looking women will go an extra mile to make themselves lighter. Skin whitening, as answers.com offers, is a term covering a variety of cosmetic methods used to whiten the skin, in parts of East Asia, the Americas, the Middle East and Africa. “Many of these bleaching agents contain steroids, hydroquinone and mercury which can affect the body as drugs do, given the fact that they interfere with the production of melanin- group of naturally occurring dark pigments, especially the pigment found in skin,” Dr Karuhanga elaborates. In communities, the problem has not gone unattended to and last year, The International Anti-Corruption Theatre Movement (IATM), a pressure group against bleaching, indicated that thousands of women in Uganda use soaps containing mercury to obtain a lighter complexion without knowing the health hazards of using such soaps. Mercury according to findings through Nordic Chemicals Group, the Geological Survey of Denmark and Greenland and Ms Uganda, causes a number of health problems such as skin cancer and nervous disorder. Steroids, on the other hand, could cause diabetes given that they increase the amount of sugar metabolism in the body thus worsening the infection, Dr Karuhanga adds. He points out creams like Pimplex usually used to treat pimples, contain mercury which is reportedly poisonous. According to mercuryexposure.org, mercury-based bleaching creams contain ammoniated mercury or mercrous chloride as a bleaching agent. Some of these creams may contain up to more than 2-5 per cent mercury that will be harmful to health, therefore resulting in mercury poisoning, especially chronic mercury poisoning. “In the Minimata epidemic in Japan, there were 42 brain-damaged children in 400 live births. Only one of the mothers had no sign of having mercury poisoning. Majority of the mothers had used mercury-based bleaching creams during their childbearing years,” mercuryexposure.org explains. “The biggest problem is that by the time someone realises signs of the effects, the damage is already done. The inferiority complex has also caught up with men and they have started bleaching their skins too,” Dr Karuhanga further explains, adding that the worst side effect victims could suffer would be worsened infections. Mercury, he adds, can affect the kidney and nervous system while hydroquinone can damage the body nerves as well as the blood cells. Steroids have a pushing syndrome and can thus precipitate high blood pressure, diabetes and could cause acne. However, that is not to say all bleaching agents have bad side effects. And as Dr Karuhanga and David Ssali, a dermatologist at Dama Medical Clinic agree, some herbal creams and soaps have been found to be good, given the fact that most are natural. According to Ssali, for most people, the intention is not to bleach. They are looking for a good skin but with the continuous trials with different products, end up bleaching their skins unknowingly. “People should be made aware of alternatives to achieving this (good skin). They could eat fruits like carrots, simsim and a variety of coloured fruits and vegetables,” Ssali who did not rule out skin cancer for continued use of skin products, adds. “By using some of these products, you remove the natural pigment which makes the skin vulnerable to ultraviolet rays, opening the skin pores further which puts you at many health risks,” he warns. According to the AAR Health services Kenya website, dermatologists caution that the treatment of skin conditions must be done strictly with the advice of the gynaecologists or dermatologists. In pregnant women, the unborn child is susceptible to medications, even those applied to the skin and great care must be taken. In neighbouring Kenya, there has been a ban on bleaching creams with stringent laws and public campaigns have been launched to address the harmful effects of these products on the skin. Much as effort has been taken to ban the importation of skin lightening creams, they are still in plenty and sold across the counter in most shops and on the roadside in Uganda. Ideally, skin whitening could be advised to treat pigmentation (coloration of tissues by pigment) disorders like spotted skin tone, age spots, freckles- small, usually yellow or brown spots on the skin, often seen on the face and pregnancy marks. AAR Health Services adds that an example of a circumstance under which a dermatologist could prescribe skin lighteners would be a situation when he detects altered skin colouring (pigmentation). A skin lightener may be prescribed for medical reasons. aku belum pernah coba kesana, kalau gak salah pernah masuk tivi. coba cari majalah Surgery, disana ada ulasan tentang dokter2 kecantikan. halo beauty on watch.. ngmg2 kok page yg ngebahas ttg wii navores ga bs di pakai lg ya?? btw mo nanya ni aibee hospital bgs ga?? yg di bogor itu.. 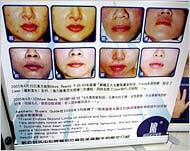 Skin treatments including lightening are offered in Hong Kong’s subway. MAKHAM KHU, Thailand — Neighbors gawk and children yell, “Ghost!” The manager of the restaurant where Panya Boonchun worked simply told her she was fired. The cream that she applied to her face and neck was supposed to transform her into a white-skinned beauty, the kind she saw in women’s magazines and on television. But the illegally produced lotion she bought in a store near this village in southeastern Thailand turned her skin into a patchwork of albino pink and dark brown. Doctors say her condition may be irreversible. “I never look in the mirror anymore,” she said, sobbing during an interview. And while many if not most whitening creams are safe, doctors, consumer groups and government officials are reporting dangerous consequences of the trend. Some involve women who use blemish creams in large, harmful amounts; inexpensive black-market products with powerful but illegal bleaching agents are selling briskly, particularly in the poorer parts of South and Southeast Asia. “I have a lot of complaints — with photographs — which show that before the cream is used the face is fine and then after it looks like it’s been roasted in the oven,” said Darshan Singh, the manager for Malaysia’s National Consumer Complaints Center, a nonprofit group. 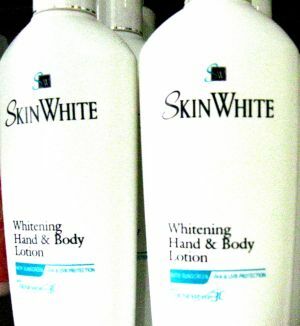 Skin-whitening products work in various ways. Some contain acids that remove old skin to reveal newer, lighter skin underneath. Others inhibit melanin, like those with mulberry extract, licorice extract, kojic acid, arbutin and hydroquinone, an ingredient in prescription creams for blemishes as well as in photo processing materials. Some of the most effective agents are also risky — and are often the least expensive, like mercury-based ingredients or hydroquinone, which in Thailand sells for about $20 per kilogram (2.2 pounds), compared with highly concentrated licorice extract, which sells for about $20,000 per kilogram. Hydroquinone has been shown to cause leukemia in mice and other animals. The European Union banned it from cosmetics in 2001, but it shows up in bootleg creams in the developing world. It is sold in the United States as an over-the-counter drug, but with a concentration of hydroquinone not exceeding 2 percent. Sociologists have long debated why Asians, who are divided by everything from language to religion to ethnicity, share a deeply held cultural preference for lighter skin. One commonly repeated rationale is that a lighter complexion is associated with wealth and higher education levels because those from lower social classes, laborers and farmers, are more exposed to the sun. Another theory is that the waves of lighter-skinned conquerors, the Moguls from Central Asia and the colonizers from Europe, reset the standard for attractiveness. Films and advertising also clearly have a role. The success of South Korean soap operas across the region has made their lighter-skinned stars emblems of Asian beauty. In Thailand, as in other countries in the region, the stigma of darker skin is reflected in language. One common insult is tua dam, or black body. Less common but more evocative is dam tap pet, or black like a duck’s liver. 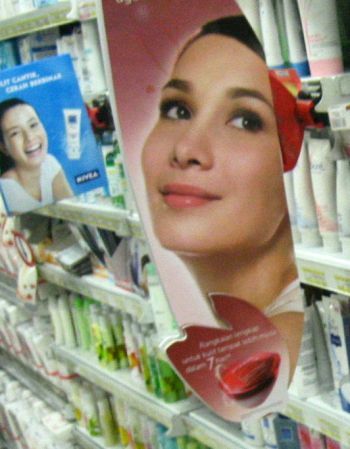 Advertisements for skin-whitening products promote whiter skin as glowing and healthier. Olay has a product called White Radiance. L’Oréal markets products called White Perfect. Last year, 62 new skin-whitening products were introduced in supermarkets or pharmacies across the Asia-Pacific region, according to Datamonitor, a market research firm, accelerating a trend that has seen an average of 56 new products introduced annually over the past four years. A four-hour television series and interactive web site by The Times, The Canadian Broadcasting Corporation and the ZDF network of Germany. Meanwhile, Thailand’s Food and Drug Administration has published a list of 70 illegal whitening creams. Indonesian officials have identified more than 50 banned cosmetics. Small groups of people in Asia seem to prefer tanned skin. In Japan, young women commonly referred to as Shibuya girls, after the Tokyo neighborhood they favor, have been regular patrons of tanning salons for a decade. But they are an asterisk in Japanese society, and Asia over all. Thada Piamphongsant, the president of the Thai Society of Cosmetic Dermatology and Surgery, said he believed that about half of all Thai dermatologists prescribed creams with hydroquinone. He stopped prescribing it a decade ago when he noticed patients with redness and itching and with more serious side effects like ochronosis, the appearance of very dark patches of skin that are difficult to remove. Some patients also develop leukoderma, where the skin loses the ability to produce pigment, resulting in patches of pink like those on Ms. Panya’s face and neck. When she first began using the cream, which was packaged under the name 3 Days and cost the equivalent of $1, she said she was very happy with the results. Her skin started itching, but she tolerated it because her complexion lightened considerably. She got bigger tips at the restaurant, where she sang folk songs, she said. But when her face became blotchy two months later, her boss told her she could no longer sing at the restaurant because she was unsightly. In April, she told her story on a Thai television program, breaking down as she described how she ruined her face and lost her job. Many women in Thailand dream of whiter skin. They think white skin means not only beauty, but also success – professional and romantic. Khun Panya comes from Rayong, a small town about a two-hour drive from Bangkok. Because she could not afford the expensive creams made by established cosmetics manufacturers, she bought her product at one of the local open-air markets, where, in addition to street food, clothing and household articles, cosmetics are also on sale. They are no-name Thai products. They are cheap and they all promise to lighten skin. Most of the preparations are banned. The information on the packaging is just as fake as what is inside, a fact most sellers seem blissfully unaware of. Commercials reflect the admiration and social recognition for the women with whiter skin. It’s a deeply racist attitude that is hardly ever called into question in Asia. In the shops, there is scarcely any cream that does not contain lighteners. “The supermarkets are full of such products”, Dr. Polnikorn says. “Many are very expensive. Those who can’t afford them buy them on the black market. And that can’t be controlled. No sooner is a product banned than it reappears under a new name.” The authorities have already banned more than fifty products. Those who make them are seldom caught.